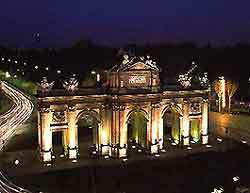 An outstanding capital city full of cultural attractions, Madrid is one of Europe's most alluring cities. Boasting a particularly high concentration of museums and art galleries, the city of Madrid also offers many large parklands, historic architecture and spacious public squares. Madrid is also famed for its football, with regular matches often available at both the Estadio Vicente Calderón and the Estadio Santiago Bernabéu. This is an enormous city and its extreme popularity is met with a huge selection of hotels and apartments, with a growing demand fuelled by prevalent budget airlines and subsequent cheap holidays to Spain. Madrid apartment rentals are a good choice for some, while others prefer luxury hotels in the lively Centro, Arganzuela, Salamanca and Los Austrias areas. Accommodation is also in good supply within the districts (barrios) of Atocha, Huertas and Sol, where narrow streets and plazas are lined with cafe tables. Also worth considering are hotels and apartments within the neighbourhoods of Barajas, Chueca, El Retiro, Latina and Malasana, and close to the Paseo del Prado and the Complutense University of Madrid.